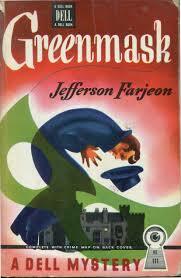 I can’t remember where I read about Jefferson Farjeon, nor if anything besides cheap availability caused me to choose Greenmask as my first Farjeon (and possibly my last.) 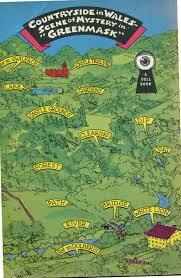 Published in 1944, it tells the story of a young man named John who’s going hiking in Wales. He picked a random town to start from and has no notion of where he’s going, but strangely this does not result in him getting hopelessly lost and dying in the middle of Wales. Before he can do that he runs into Suspicious Characters. A mysterious short man tells him there’s no hotel around there. A quarter of a mile later, there’s an inn, complete with hostile innkeeper who tries to talk him out of staying there by saying they’re full. But in butts this chick he met on the train and says yes, they do have a room and apparently the innkeeper is then powerless to send John on his way. Why John won’t take no for an answer, I’m not sure, except there’d be no story. More suspicious characters act suspiciously and John goes over every incident in his mind after it happens. Sometimes multiple times. Yes, we know. We just read it. Then he meets a new, unsuspicious character and he tells him everything. It is very fortunate for John that all the crooks act like crooks and the non-crooks don’t. Because John has a way of telling people he trusts absolutely everything. He’s a real dope. So, there’s no real mystery about whose committing the crime(s). For quite a while there’s a mystery about what crimes are being committed, but that gets solved about halfway through. It takes until the end to figure out the reason for these crimes and it feels like a very long hike indeed. Why did I read it? It was in my purse and I’d pull it out and read a few pages when I had to wait somewhere. Eventually I got far enough in I wanted to finish. Presumably Mystery in White is better. I might try that one, but I think maybe I’ll wait a bit. It is now 7:04 and the Minithon is over. It was a good minithon despite my lack of prep, I still managed to be highly distracted and get only a mini amount of reading done. The Wimbledon Poisoner – about a sad sack English Everyman who gets fed up and decides to poison his wife – starts off well. It is hard not to eat too many peanut butter pretzel nuggets. And why is it hard to focus on a book while lazing in a hammock? I don’t know, but it was very nice out until the rain came. Read a word. Stare at a tree. Read another word. Wonder why the bird calls are so raucous. Etc. Thanks Tika, for hosting and Glynis and Alley for stopping by. Sadly, for mysterious reasons I can’t seem to comment on most blogs, or I’d comment on yours. I do read them and enjoy, though. I hope we all get together for another ‘thon soon. And I’m not doing well. Last time I had bought every mini snack that would fit in a cart. This time I have mini tater tots and pretzel nuggets with peanut butter. Yay for a balanced diet. I’m also late, failed to sign up and don’t know what I’m reading. Possibly more of Pleasure by the Busload in which a group of friends travels around Portugal in a Microbus (can’t get more mini than that) in 1961. Or there’s The Wimbledon Poisoner, because poison is a small weapon. Or I bought the Magicians, but don’t know enough about it to justify minithoning it — can I bring it in based on the mini amount of information I have on it? Someone said it was like Harry Potter for adults. At any rate I’m here-ish and hope to get a mini amount of reading in. But mostly just read peoples’ tweets and eat pretzel nuggets. I can’t believe I haven’t posted since the Readathon. It’s been a busy month, without a lot of reading, but still. Unfortunately too busy to join in Beowulf readalong, which would’ve been good as I have long meant to read it and it’s so much easier with others. 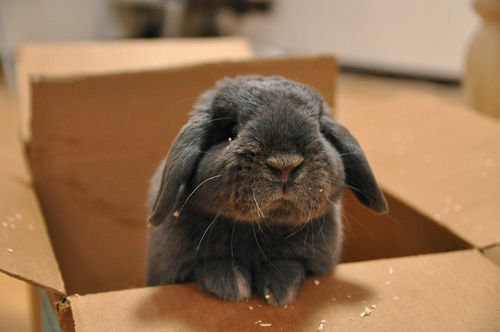 Worse, I bombed out of the Trollope reading. I started The Way We Live Now which I enjoyed the beginning of, but only got maybe 100 pages in. Instead I read The House Without a Key – the first Charlie Chan novel, which is based on a real Chinese/Hawaiian police detective. This could be my theme for the year: Chinese detectives based on real people, except I don’t know if there are any more. 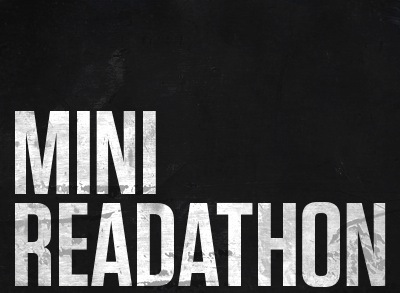 Also, tomorrow is the Minithon. I shouldn’t join in, but I believe I will. Maybe I’ll make some progress on something. At least I can eat mini food. That’s always a plus. So, I read for the Readathon – Cold Comfort Farm, a book recommended to me a million years ago which has a movie based on it I highly recommend. It is a parody of the sort of literature I loathe and never read, but you don’t need to read it to get it, I don’t think. I saw Precious Bane on TV decades ago and that was more than enough. The book is quite a bit like the movie except for one confusing aspect. It was published in 1932 and seems to take place in that year until you get to a point where it mentions a television phone. Out of the blue, a television phone. Shaking my head I read on until I got to the Anglo-Nicaraguan War of ’46. This was too confusing. This made the speaker in question about 90 years old if it was 1846, which I thought it had to be, but no. CCF is set in the near future although there are only maybe 3 sentences in the entire book which give a clue to that and they make no sense because there was no Anglo-Nicaraguan war of ’46. But thanks to Wikipedia I learned the book is set in a nebulous future which was really nothing at all like the future and almost exactly like the time in which it was written. The thing to do is ignore those few references and just picture them in 1932. Easy to do as there is no point whatever in having set it in the future and someone should have talked her out of it. Otherwise, a delightful read in which young Flora, setting out to make her way in the world, decides to live off her relatives. 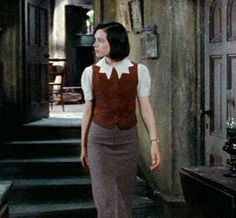 “Robert Post’s child” which is what she is called by all the residents of Cold Comfort Farm – the Starkadder family – would be a complete fish out of water in this environment except Flora is the sort of fish who changes her environment to suit herself. Watching her do it is the entertainment of the book and it is highly entertaining as long as you have that sort of sense of humor, which I do. I might seek out more Stella Gibbons. I think I have one somewhere. 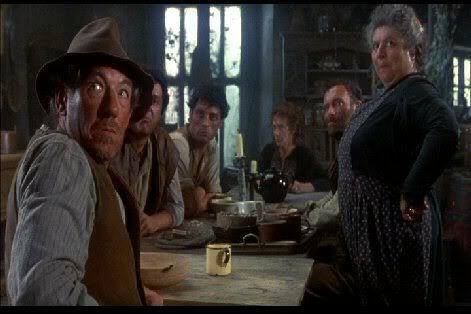 There’ve always been Starkadders at Cold Comfort Farm.